Watch Video : Kanhaiya Kumar Comeback Fiery Speech at JNU Campus : Jawaharlal Nehru University Students Union President Kanhaiya Kumar delivers a firery speech at the campus after getting out of jail is worth watch. Kanhaiya slammed Prime Minister Narendra Modi, the Bharatiya Janata Party (BJP) Government and the Rashtriya Swayamsevak Sangh (RSS) for attempting to impose their divisive ideology in the nation. “The attack on JNU is a planned one as they want to de-legitimise the UGC protest, and to dilute the fight for justice for Rohith Vemula,” he said, amid loud cheers. He started his one-hour long address by thanking everyone who supported him and the university during the crisis, before targeting the government. 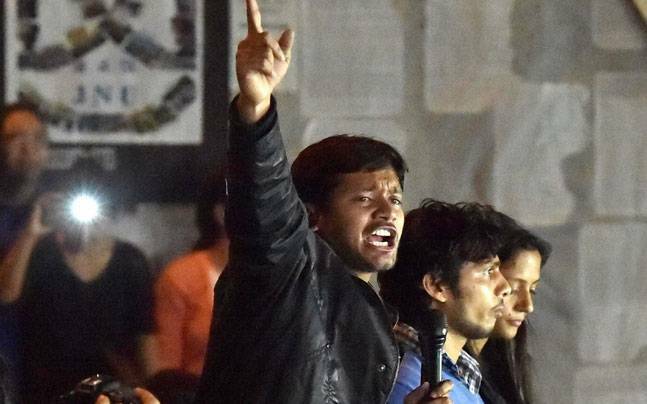 You will not teach us ‘deshbhakti’ or ‘deshdroh’: Kanhaiya Kumar takes on the system in his speech at JNU.